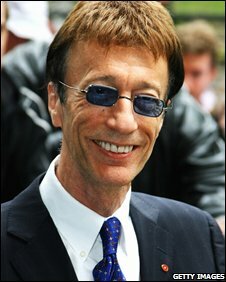 As one third of the Bee Gees, Robin Gibb is one of Britain's most successful singers and songwriters of the last 40 years. The group ended when Robin's twin Maurice died five years ago. Robin has since embarked on solo tours and is now working on a new solo album. He is also leading a campaign to build a memorial for World War II airmen. He talks about his future plans with brother and bandmate Barry, gives his verdict on the current pop scene and discusses why he wants to honour his war "heroes". Are you still working with Barry? There's a musical going on Broadway and the West End next year that will be our life story. It's being put together at the moment and we're working very closely on that. That's the next big thing. We're at the stage of casting. They haven't cast me yet. But I hope they get somebody really good looking! We decided that on an emotional level at that point. Whether or not that will change, we don't know. But at the moment, it's still very much an emotional thing - that was the three of us. I'm very open to it but it's up to Barry whether he feels comfortable with it, but it's a personal thing and we'll do it when the time is right. Have you talked to him about performing together? We often talk about doing shows together but it's always left open to the shows that he particularly wants to do. So when or where is to be decided at a time when he says yes, I suppose. So it's not a no, it's just emotionally when it's right. What's your opinion of the current pop scene? I like to see songwriter-singers being more encouraged by record companies, which I don't see very much of. I think songwriting is the backbone of the record industry tomorrow. Being a songwriter myself, I think it's imperative that these people are given free rein and encouraged by the record companies, and time's got to be invested in them. The record business, like every other business, is being streamlined to the bottom line so they don't want creative people involved in the decision making in record companies, they want lawyers keeping the status quo. They don't want to spend money or artists or songwriters and they don't really want artists who write songs, they just want artists who look like models and get outside writers to write songs for them, or cover songs that have been hits before. Or they can get the Scissor Sisters to have a hit with a song that sounds like the Bee Gees and have a hit with them rather than spend money on songwriters and being original. 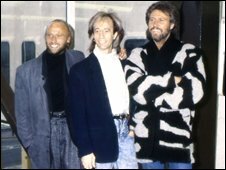 How do you think the Bee Gees would have fared if they were starting out today? I can't answer that question. All I can say is I would hate to be a new artist starting out today on any level. It's not as much about melody as when we started out. Emotional values were also very important to sing about. Today, guys don't like to sing about emotions. People still like to hear about emotions because that doesn't change. Why are you involved in the RAF memorial campaign? I'm doing it in my capacity as president of the Heritage Foundation. I'm championing a campaign for a permanent memorial to be built in the centre of London for RAF Bomber Command, which lost 55,000-plus men in World War II, which has not been recognised by successive governments. Growing up, these people were heroes to me. They were seen as the guys who won the war, and the war had to be won. Our backs were against the wall and we could have been occupied any day in this country. And these guys risked their lives. You are friends with Prime Minister Gordon Brown - what has he said? He's given me his best wishes on the endeavours but he's a man who has to wear different hats and what we're doing on this is not about the prime minister saying yes or no.